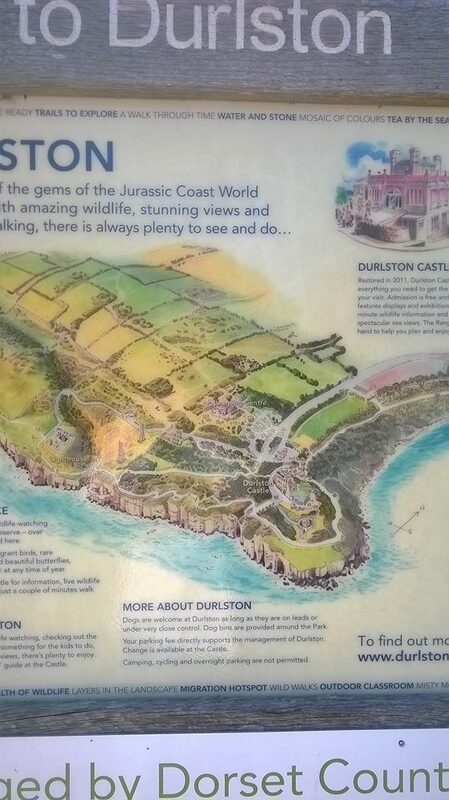 Durlston Country Park & Nature Reserve is on Dorset’s Jurassic Coast, close to the seaside town of Swanage. There is ample car parking and the excellent Seventhwave Café, recently refurbished, and situated in the Victorian folly known as Durlston Castle. Leaflets and guides are available from the shop in the castle. The park gives easy access to cliff top paths, with stunning views of the Jurassic Coast. The castle has lift access to its terraces and views of the coast. You can walk cliff-top paths to Tilly Whim caves. The caves are now closed to the public but some of the caves are visible from the cliff top. The caves are not natural formations, but old limestone workings closed in 1812. Just beyond Tilly Whim caves is the small lighthouse at Anvil Point. The cottages attached to the lighthouse are available to rent. A hard surface, tarmac road, behind the lighthouse, provides a route back to the café and a refreshing cup of coffee, and cake if needed. Alternatively you can continue along the coastal path for more stunning views of the coast line.